What does it take to successfully manage a development office? Kind of looks like a whirlpool, doesn’t it. I think it’s much more reflective of what life is like in an organization that any neatly boxed flow chart. Unfortunately, it’s difficult to get a circular column into a rectangular format, so let me take you through each element in order. Every good leader keeps their eye on the prize. Lofty goals and more achievable shorter term objectives drive all activities. Such is true of the fund development leader. How does your department help the whole organization reach its broader objectives? Maybe this sounds obvious – raise the money, right? Yes, but … that’s not all. When I worked at that environmental group, while we needed to raise annual revenues, we also needed to increase the numbers of our members. Now, strictly from a fundraising perspective, the $25 and $35 donors contributed a relatively small proportion of the total dollars raised and consumed a big share of the development budget. But, because we needed legislation passed (or stopped) at the state house, we needed the political clout that a large base of members brought with it. So, money and numbers were both important. Once you’ve got the big picture, then you’re ready to collaboratively define with the other members of your department how each person contributes to the success of the department and the organization. What’s success for your membership coordinator? For your major gifts officer? Your database manager? Staff need to know what they are expected to deliver and why it matters. 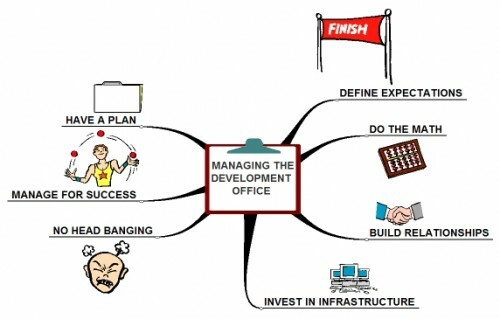 Your fund development plan is likely to contain three major elements: 1) the plan to get the money in the door – the solicitation plan, 2) the plan to keep donors well-informed, appreciated and connected to your organization for the long haul – the stewardship plan, and 3) the plan for how the department will run like the well-oiled machine it needs to be – the management plan. I won’t go into detail about the first two components of the plan, but let me say a little more about the management plan. Items to include in this plan include how you’ll build the expertise and performance of your team (both staff and volunteers), what you’ll need in the way of technology (e.g. donor management software), research and analysis, planning, budgeting, and any other supporting activities you can think of. Good development managers inhale data and use it to make wise decisions. One of the cool aspects about fundraising is that you can count and analyze numbers and calculate results – a lot easier than, in my opinion, trying to determine the impact of your stop smoking education campaign. Now, don’t go too data crazy. What you are trying to understand is what works and what doesn’t – both in the short term and projected into the future. Remember, to stay even, you’ve got to retain the donors you have and replace the donors and donations you lose. To grow, you’ve got to stay even and raise more money, either by acquiring more donors or increasing the giving of the donors you already have. Of course you know about building relationships with donors. Sometimes we overlook the other relationships that really make a difference in our work. It’s hard to get grants written without the support of program staff or make purchases without the support of finance. And you’ll want really good partnerships with your CEO, other members of your management team and volunteer leadership, especially your board. providing interns, research, or even background information on complex issues. It is really hard to run a growing and dynamic fundraising program when you don’t have quality donor management software, access to the internet, online giving capabilities, ready access to your budget and in-house networks, among others. Enough said. All the best plans and technology are just paper and machines without the people who put them into action. It really makes a difference to have competent, enthusiastic staff, with a quest for excellence and knowledge, as part of your team. Nurture them. Give them the authority and feedback they need to do their jobs well. Remember that their personal lives are really important too – life outside the office helps all of us be happier and more informed employees. Celebrate success. I’ve seen too many development directors spend too much of their psychic energy trying to move immovable objects (darn those board members for not doing what I think they should!!). Unless you’ve got some pretty significant leverage, it’s really hard forcing other people to do things they don’t want to do. Instead, the best strategists figure out how to move around resistance. They identify what does work, and do more of it. I happen to believe that people should be energized and enthused about their choice of work. After all, we spend so much of our time there. When I reached the point that I couldn’t stand coming home every day angry and frustrated by my job, when it no longer satisfied me, I knew it was time to move on. Sometimes that’s the best decision any manager can make. Gayle L. Gifford, ACFRE, is author of many books and articles on nonprofit management, including How to make your board dramatically more effective, starting today and Meaningful Participation, an activist’s guide to collaborative policy-making. A consultant, facilitator and trainer with 30 years of nonprofit experience and President of Cause & Effect Inc., Gayle helps nonprofits from the grassroots to international be more strategic about their work, their fundraising, or building a stronger board. You can reach her at gayle@ceffect.com, www.ceffect.com.